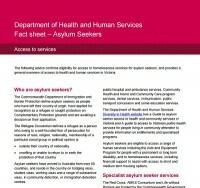 The Victorian Department of Health and Human Services (DHHS) has released a new Fact Sheet that confirms eligibility for access to homelessness services for asylum seekers, and provides a general overview of access to health and human services in Victoria for people seeking asylum. Download the Fact Sheet below. Department of Health and Human Services (April 2015). Document name: Victorian DHHS Asylum Seeker Fact Sheet April 2015.